This Dinnerly post contains affiliate links, but it is not sponsored. I received a free box to review. I did an updated review of Dinnerly here. Get $20 off your first two boxes ($10 off each of the first two) with code AFENO10X2MENW. 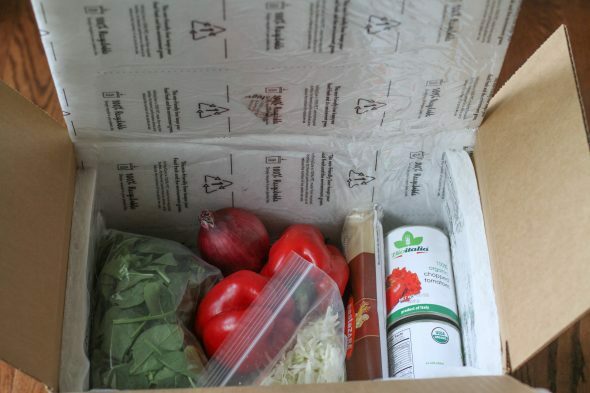 A while back, I wrote about why I don’t use meal kit services, like Blue Apron or Hello Fresh. I keep getting emails from them asking if I want to try them and blog about them, but I’ve always felt they’re a little too expensive to be a good fit for for my blog. But, I recently got an email from Dinnerly, a company that offers a similar service, EXCEPT it’s half the price! That is definitely way more affordable, so I said yes to them sending me a box to try. 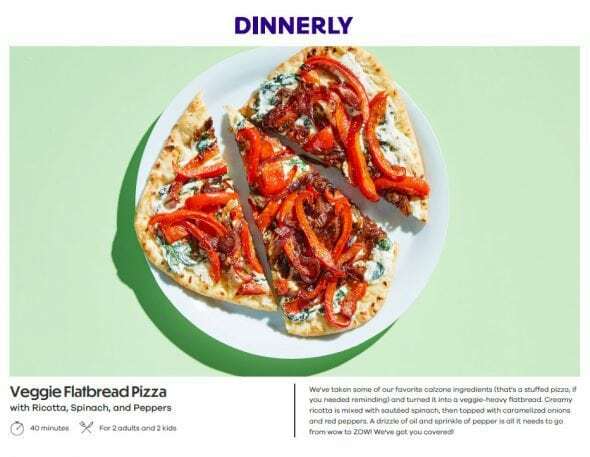 Dinnerly is also different from Blue Apron et al because their meals have only six ingredients and six steps. This cuts down on packaged waste and also on your cooking time. And I noticed that instead of a hard styrofoam cooler, Dinnerly just uses a recyclable box liner. To keep things cool, there are two ice packs, which are reusable. Or, you can drain the liquid and recycle the plastic. Here are all the goodies from my box. Dinnerly is half the price of other meal kit services, but they still provide high quality ingredients. For example, the two packages of ground beef are grass fed, and the canned tomatoes are organic. So, they’re not skimping on quality. Rather, they save money by doing minimal marketing, and creating meals with fewer ingredients. 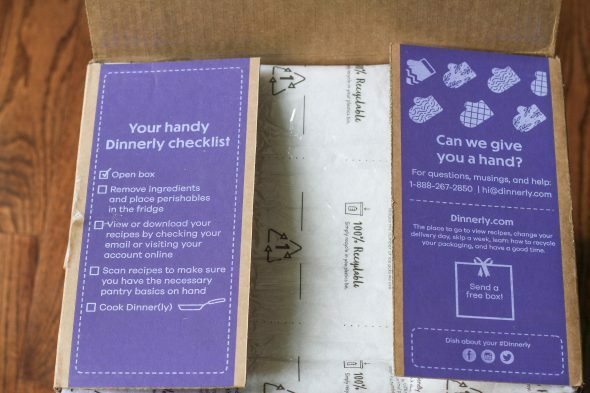 Another way Dinnerly saves costs is by sending digital recipe cards instead of the printed kind. Here are the three recipes we got. Each recipe has step-by-step instructions, with six steps or less. Because the recipes are super simple, they’re very manageable for kids. Zoe and Sonia worked on the spaghetti and meatballs together, and Sonia did most of the work for the veggie pizzas as well. “I love Dinnerly, Mom!”, she said. Dinnerly meals basically provide you with a main dish, and I added things like a green salad or fruit salad. But that feels very easy to me…it’s coming up with a main dish that is a larger headache, and Dinnerly covers that. 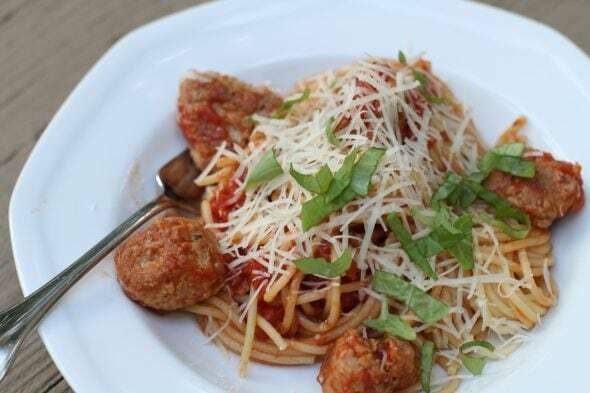 The portion sizes that Dinnerly sends are definitely bigger than the portion sizes that we tend to eat, which means that the four-person box can feed six of us. That makes it actually under $5 per serving. I can feed us with grocery store food for less than that, but I can’t take us out to eat (even fast food) for that price. So, if you got a Dinnerly box as an alternative to takeout or fast food, I can definitely see it saving you money. And you’d likely be healthier too. There’s no getting around the fact the meal prep kits do bring more packaging trash with them. However, not everything in my kit was more packaged than grocery store items. The tomatoes came in cans, the ground beef came in a package just like my local beef does, the peppers and onion were naked, and the spinach came in a bag like it does at Aldi. Also, the spaghetti was a full pound, in a retail bag. Also, when you buy naan or tortillas from the store, they come in a plastic bag just like Dinnerly sent. Again, if you compare this amount of trash to the trash created by takeout, it’s not a significant difference. Probably the largest trash producer is the ice packs, but they can be reused or freecycled. And the box and polyethylene bags can all be recycled as well. So, it’s more trash/recycling than buying groceries at a bulk store, but if you’re comparing it to takeout or to grocery store purchases, it’s not shockingly different. And, since Dinnerly meals have fewer ingredients than most meal boxes, there’s less packaging overall. At any rate, if you’re going to get a meal box, Dinnerly is one of the least trash-producing options out there. These veggie pizzas were super tasty! Who should not try Dinnerly? If you’re already an experienced, adventurous cook who has no problem grocery shopping, cooking, and avoiding takeout, then Dinnerly probably just isn’t necessary for you. Keep on rocking as you are! Who might find Dinnerly useful? then I think Dinnerly could be a great option for you to try. 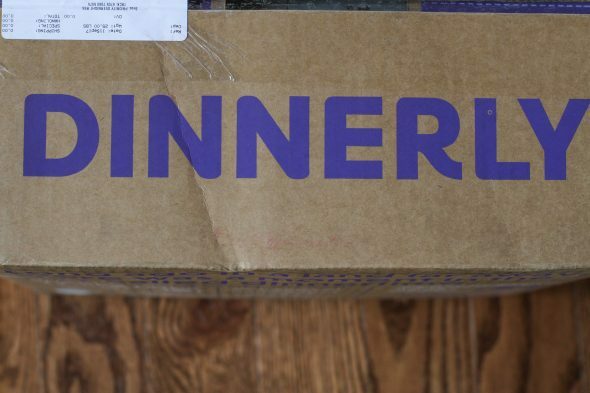 Dinnerly delivers almost everywhere in the U.S.! The only places they don’t cover are Montana, the Dakotas, Wyoming, New Mexico and also most of Arizona. Click here to visit Dinnerly and choose either the two-person size or the four-person size. Dinnerly can come weekly (3 meals per box), or you can skip deliveries as often as you like. Totally up to you! If you give Dinnerly a try I’d love to hear what you think. Yay! I’ve been excitedly waiting on your review! Those meals all look super delicious! I am the same as you, never wanting to try meal services because they were too expensive for our budget. So when you mentioned these guys, I was super interested. Unfortunately we aren’t in the service area But I’m hoping that changes soon. For weeks that I know will be busy, especially as my kids get bigger, this would be a huge advantage time wise. Come on Dinnerly! Move to the Southeast!! Thanks for the honest review and great pics of the box! I can basically ditto Ember’s entire comment! I have been eagerly waiting your review and based on your recommendation, was all ready to go give it a try. Boo! We are not in the zone either. Sigh…hopwfully , they will change that soon! We just need a change! Same here. Looks interesting and affordable to try, but they pretty much left out everyone in the south. I think they actually comecro my area! However we do Blue Apron and I think that one fits us better. I like that it has sides too, and it’s saved us money on food waste! But everyone’s lifestyle is different and I definitely think these meals look a lot faster/simpler! I will say it looks like Dinnerly packaging doesn’t have any less than BA (no styrofoam in that packaging, reusable ice packs and everything’s recyclable). I don’t need a meal delivery service, but I like the looks of this one. The pricing is sure better and I’m all about organic and grass fed. Since I’m in the Southeast too, I can’t even recommend it to anyone around me, but if it ever gets here, I’ll tell people it sounds like a good choice. I like that it’s kid-friendly — my 11 year old granddaughter would love doing this. She took a 4-H cooking class one summer, and is hooked on the fun of cooking. Kristen, have your kids taken any 4-H summer camp classes? Are they available from your county extension agent’s office? My granddaughter has taken cooking, drama, make your own spa products, and some others I can’t remember, even though she’s not a member of 4-H. She really enjoys them. Pretty sure I will never live in place where anything like this is available, even if I did have any interest in such a thing. I’m afraid I fall squarely in the first category of “not for me” for all the reasons you mentioned, plus the fact that I live so far from anywhere that no company is going to find it cost-effective to deliver where I live. My idea of an easy and mostly prepared dinner is eggs and sausage. Or one of the many things I already made and have in the door of the standing freezer in the utility room. I am my own prepared-food service. I recieved my first Dinnerly box yesterday. It will be my last. I was NOT IMPRESSED! Ingredients were tossed into the box and no recipes. If I wanted to print recipes, I wouldn’t have ordered the box. I’m still shaking my head in dismay and thinking I actually paid almost $30 for this. This is interesting. 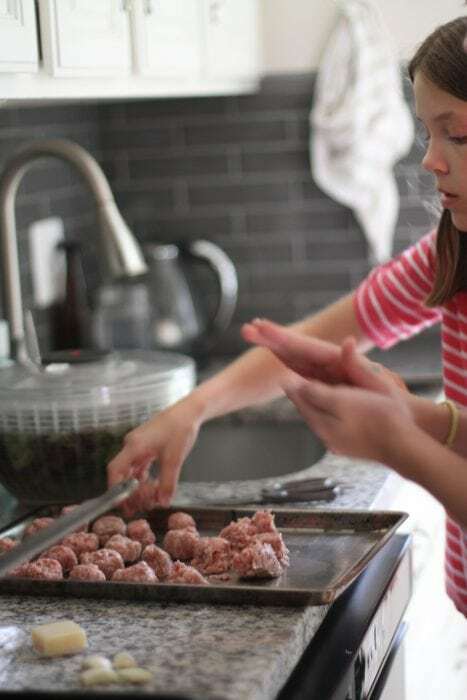 We don’t need it right now (I like to meal plan and cook, my husband grocery shops every Sunday night) but I can definitely see us using it in the future, especially as our kids get older and we let them take over cooking dinner once or twice per week. They’re currently 8, 6, 4, 4, and 2 so we’re not quite there yet. Thanks for the review! How was the taste of the finished dishes? They were good! 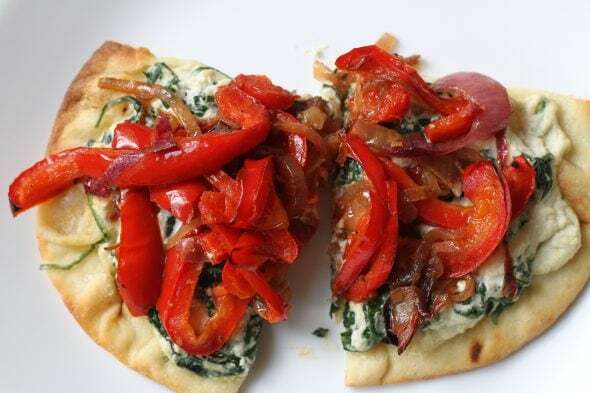 I wrote about them last week during my menu plan and 52 new recipes posts, so I didn’t want to repeat myself too much here. The pizzas were definitely my favorite, largely because they were pretty creative. I’m very early into my second pregnancy, and just like before, the thought of cooking dinner is overwhelming. Nothing sounds good and I’m exhausted. Walk by me with a steaming plate of spaghetti and I want it. Give me all the ingredients to cook spaghetti and I’m headed to McDonalds. Ha! Normally, though, I would fall into the second category, and this would be a good option. AND they deliver to my area! I’ll have to keep this in mind. Beth – do you have a meal prep service in your area (like Dream Dinners)? We have one in our town that does all the pre-prep for you – you just pick up the frozen meal. You do still have to defrost, but there is no mess from prep. I was really burnt out on cooking every night and dreaming of take-out on a regular basis but went with pre-prep instead. It usually runs us about 4.50 a serving and it has saved my sanity. Now we use it about once a week and I love it. The problem with Dream Dinners was that it wasn’t “Fresh Produce” it was stuff you have to Freeze, plus you have to order a minimum of 36 servings in order to even cook, way too much. I love the “Prep” work on Dinnerly, but their menu is very less desirable for me and my family. Dream Dinners was great but the minimum you have to do was over the top for me and my freezer! This is definitely a more affordable option. $5 for everything included in the package (especially the beef) plus shipping is a GREAT price! I have never ordered from Blue Apron or Hello Fresh either. The high prices and packaging are such huge turnoffs for me. I wrote a post about why I don’t order from them, so they probably will never reach out to me for marketing, but I stand my ground. I think it is $5 per serving, not $5 per box. Was intrigued by your post. Sounds good, until you realize that the menu is set and there is currently no vegetarian option. I can see why they do that, but it just isn’t feasible for us that way. We are not vegetarians but we don’t eat red meat or pork. Also, HOW they deliver is an issue in NYC. They have post office some days and fedex others and it is unclear whether you can specify day of delivery. That last item is very important for us as we are not home some days to get a delivery and you cannot leave this kind of stuff out in our apartment building lobby. Like their pricing and simplicity though. 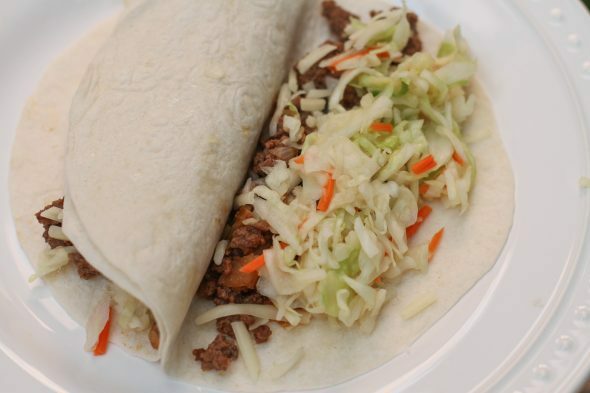 We would consider it a gift for some college kids and non-cooking inclined friends. Yeah, we did have one vegetarian meal in the box (the pizzas), but the other two meals had meat. I had the same experience. Unfortunately there is no option to select dietary restriction. We too are not vegetarians but rarely eat redmeats and never eat pork. The meal options are not known ahead of time and you have to enter your shipping info and.credit into to get started before you see meal choices. I literally signed up and no more than 10 mins later I cancelled subscription of which I received an email from Dinnerly that my first delivery was already being processed and couldn’t be cancelled. This is crazy especially because I called the 888 number afterwards to speak with someone and received a message that the office was closed and to call back during normal business hours. So how can my order be processed when the office is closed? And there is one week until the delivery is due. This is. A big scam to rope people into subscription without disclosing enough informationnup front. I did not like Dinnerly at all. The food does come well organized. It’s all loose in the box w no instructions. 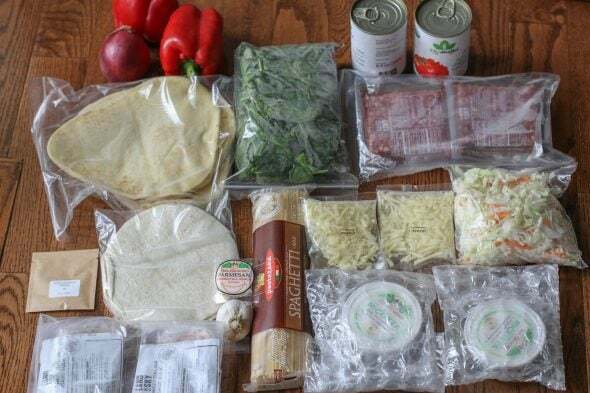 Home Chef is more expensive but all the ingredients for each meal are packaged neatly together and easy to read and follow instruction cards are with each meal. Dinnerly is definitely not good . I had the same problems with trying to cancel I had a week and half before my first order was to arrive . Same problems no real meal option and if you look at the next month it was the same meals as the previous month. The produce was thrown in the box it arrived messed up there was no insulation or inner cooling system to keep the produce cool , only a sliver bag with meat and 1 ice bag . Some of the meat wasn’t even cool , had to toss it . No refrigeration . It was definitely not worth the money . I had used blue apron in the past and loved it . Everything was always cold or frozen , you got alot more for your money . Dinnerly is awful , don’t even try it , not worth it . The packaging and amount in the pictures above is not what you get . This person that is recommending this company got the stuff for free to try and post comments and such , they didn’t give you what the give everyone else because you are promoting thier product , buy a week of dinner send it to a different address under a different name and see what you really get . I ordered the two person meal (there’s 3 of us eating, but one doesn’t eat much). I hope it tastes great! I’ll be letting my 10 year old help me cook. If it’s as good as it seems then $39 for three meals a week will be a good deal for us. I struggle with cooking every night since she has gymnastics three days a week. This should help me. I’m keeping my fingers crossed! Great review! I personally wouldn’t use meal boxes because we’ve made food savings a huge priority–as much cheaper as boxes are to eating out, it’s still cheaper to cook from scratch without a middle man. But, as you say, I think meal delivery services make cooking more accessible to people who might be new to cooking at home. I think they can be a great springboard to learning how to cook without the middle man. Also, props to Dinnerly to reducing waste when possible, because that’s a big deal! Thank you for your review. I haven’t tried it, but just looking at the website, I agree with your reasons for why to get/not to get the service. We are experienced cooks who very infrequently get takeout, so for us it is still too expensive. I’m glad you addressed the question of how these box services can help you learn to cook. My husband and I were gifted a couple of meals from Blue Apron at Christmas from my brother and his wife. It is something I would never have tried on my own, but I have to admit it exposed me to cooking techniques I wouldn’t have otherwise tried. It made me realize that I had been underseasoning things. I have a whole new relationship with black pepper now. And that has value too. I’ve been intrigued by the meal prep kits, not for dinner as a family, but for an occasional date-night experience with my husband. Dates are usually at home, since we have a hard time finding a sitter qualified to care for a trach/g-tube dependent child, and we love to cook. That said, these recipes look awfully simple, and while there’s nothing wrong with simple (I do simple for family dinners!) I think I’d opt for the more expensive options that have fancier meals that I’d rather not waste on the undeveloped pallet of a 1, 2, and 3-year old! I guess that’s why there are so many options for these meal kits! Everyone has a different reason for trying them or using them! 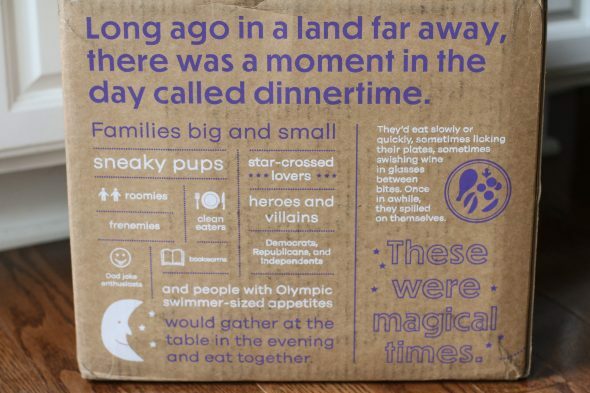 I think a Dinnerly box would make a great sleepover activity for teens. Let them entertain themselves in the kitchen. We’re empty nesters now, but a few years back it might have been fun for the kids to give it a try. I was reading this thinking it would be something fun to get my daughter in the kitchen (I’m so bad about this…) but alas! They do not deliver to our area. I’m so happy to see your review. I signed up when you wrote the first piece a week or so ago. Their map must be out of date, because I’m in Dallas and they deliver to me. My first shipment is next Monday so I’m pretty excited. I just wish they offered smaller plans, and a healthier option. But their website basically says they will in the future, but they are new and just need to generate interest and income. I believe my option to choose is even more important when I am paying a premium price. I just signed up for a service and am already unhappy. We haven’t even received the first box. I was allowed to pick out our food preferences during sign up. I had to process my payment before being allowed to choose our meals. The options were incredibly disappointing. Especially since one of our three meals apparently has to be vegetarian. I do not have any desire to pay this kind of price for a plate of rice with a hard boiled egg on top. I went back today to choose future deliveries and lo and behold, all my rejected choices just continue to reappear each week. Apparently we eat what we have or chose the vegetarian options. I find this disappointing and will be canceling this service the moment my first delivery hits the door. I was delighted to read this new post on a new company. I hope they expand and come down South. For five dollars a meal, I would be more understanding. Meanwhile 10.00 plus for rice and an egg just makes me angry. I love that Kristen gives honest reviews for quality products. Being misled me want to cry. So after reading the comment about other delivery areas being available, I went to their site and they do deliver in Georgia. Kristen, do you have a link with any type of discount we can use. Oh wow! Maybe the map I used was out of date. Dinnerly doesn’t offer discount codes (I asked!) because their service is already half the price of other similar services. I’m sorry! Brook, I would like to know which service this was. Thanks for helping us all to know what to expect. I ordered from Blue Apron. I also see on another popular blog site that Martha Stewart now has one of these kits. Kristin, I will be ordering something else. I like Dinnerly because it showed the meal options and they looked very child friendly. Will you get any credit for our sigh ups? Due to current medical issues we will buy one box of some company. Contributing to your blog would be an added bonus. I certainly appreciate you. We love our Home Chef meal plan! We have a WIDE variety of options to choose from each week, we chose 2 meals per week not 3 and have never had a bad meal. We also added the fruit basket and occasionally a speciality salad. It does cost about $9.95 per meal but affords us many options. The only thing is they add $9 to ship. So three meals for two is $40. So it comes out to $6.50 per person with no side dishes. Also with this one you cannot choose your dishes. You might get shrimp and have allergies. The digital recipes are a little annoying too trying to unlock your phone to read them as you cook. Otherwise this beats the others in price. I’m on the fence because of the shipping cost, too. I guess it might make more sense if you have a larger family, but paying an extra $9 shipping for a 2-person meal makes this a lot less doable for us. I have been using this service and have really enjoyed it. I live alone and every time I want a meal or have a meal plan and go to the grocery store it is way over $40.00 dollars a week. I like them selecting the meal plan, I wouldn’t think of the dinners they send and I like the thoughtless variety! Also, I don’t need sides as the food is filling. As I know in advance what I am cooking, if I want a side I have time to pick it up beforehand. The box would easily feed 2 with a leftover for lunch. Right now they are getting a “10” from me! I agree about the shipping costs. If the shipping were less I’d give it a try. I just signed up, and had 6 options to choose from for 3 meals. My Home Chef is looking better and better. I’ve been using Blue Apron for a few years now and I really like it. It has been very helpful for my family since my husband and I both work outside of the home and have two hungry teens that need a good meal each night. It is a bit expensive but cheaper than takeout plus many nights we have leftovers that can be eaten for lunch. I’ve learned some new cooking skills and my kids have tried new foods they wouldn’t have been exposed to. Like Dinnerly you can skip any weeks you don’t want or need a meal – so I’m considering alternating between Blue Apron and Dinnerly! Best of both worlds! I live in Europe so Dinnerly is not an option for me, although it looks very delicious. I was wondering (and maybe you could write to them? ): I am pretty sure there could be a way to get those ice-packs back to them. 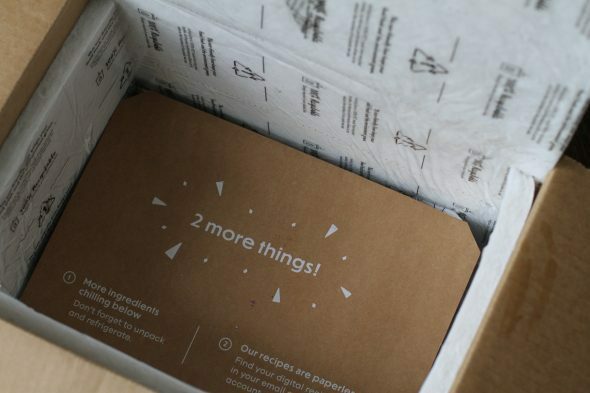 Like for regular subscribers, collection could be every other month or so, just by a parcel sent back to them without any costs (similar as Amazon when you send back an item). It could be beneficial for Dinnerly and it would be great for Planet Earth. Thank you for the blog, as always! Re: the ice packs. I, and several relatives and friends get meds shipped with multiple ice packs, and while at first I thought I might re-use them or something, they pile up fast! I contacted the pharmacy and they don’t want them. I offered them to various people and organizations, and no one wanted them. They would be heavy to ship. I finally went to the website of the ice packs and it explained to just throw them in the garbage. I am an avid recycler so I hate to do this, but found no other options. Too bad they don’t have services in Canada! I was tempted to try Miss Fresh because I received a rebate, but at 9$/portion, even with a rebate, it’s still really expensive! Those services are more for people that really can’t go groceries shopping IMO, like someone who is sick and home bound. Otherwise, who does not have time to go groceries shopping, really?? Isabelle, we are retired so it’s not about having time to shop. We live in a rural area with no options for fresh produce near by. When we do buy, we buy quantities then 1/2 rots in the frig. This is about having easy access to good healthy food. I have 2 kids and I am working on getting a license for my chosen profession. I have done the leg work in my area and it is almost 8 to 12 dollars cheaper then the grocery store once time, frustration, gas, and the actual food pricing because you have to so much more than you need most the time. For me these boxes are savior. I am not sick, home bound. I received an invitation to Dinnerly recently so was glad to see your review. We’ve been using HelloFresh for about 2.5 years and LOVE it (and their packaging is also all now recyclable) but thought we should explore other options. Your review actually convinced me to stick with what we have for Now. We’re not vegetarian but do the veg option (3 days per week of that is good…). The portions are very filling and they do NOT suggest you add sides. After adding Dinnerly’s shipping costs and a need for sides, and because HelloFresh veg option is slightly cheaper than regular, we think we should stay, because the dishes are inventive and delicious. (I’m not on their payroll, but love it.) We might look into one of the other devices, tho. Sorry but you forgot to mention the shipping charges which does not make it 50% off. Also their website needs some work. 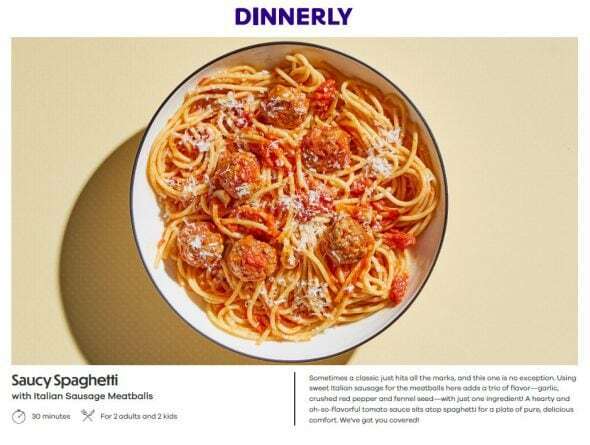 The main reason I stopped using Hello fresh, Blue Apron and home chef is menu selection if you do not one out of three particular meals its not worth it from any of them. Dinnerly recently released an app, which addresses the website issue. It’s really well designed. Not much chance of them delivering to where I live; I’m in the UK. I signed up my daughte, who recently moved off to college, after reading your review. She loves it and it gives me peace of mind knowing she’s getting at least three home cooked meals a week. The recipes are super simple and gives her ideas to carry through to other weeks. Thank you for sharing. Oh, I’m so glad! Yay! Dinnerly menu items appear to be more simple (pizza, tacos) than Blus Apron. We have been using Blue Apron and have been introduced to new tastes and lot of kale, spinach, rice and collared greens sides. We actually like the flavors in their meals. We both have lost weight by eating the BA portion size while still being sated. Might try Dinnerly and do my own sides. Yes, Dinnerly is definitely less fancy than some other meal services! Basic staple kind of foods, mostly. Do you have choices as relates to menus? I thought I saw somewhere that you have no choice as to what you get. What if you don’t like what they are sending? 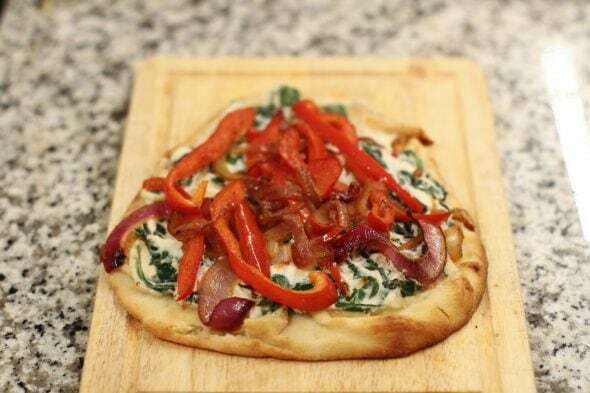 I have tried many of the majors (Blue Apron, Hello Fresh, Home Chef), and like them all, with the initial offer of 1/2 off, otherwise too pricey. Recently got another offer from Blue Apron for a completely free 6 meal box ($60.00 value). Free shipping as well. And everything was delicious. I almost feel guilted into buying a full-priced box, but under no obligation to do so. I am an experienced cook, and love to shop, but still found these services to be fun, and gave me new ideas But a set menu? Not so sure….. I didn’t see an option in Dinnerly to change the menu, but I could be wrong. Just signed up and can’t wait to receive first box. There is just me so I can freeze ahead for lunches! I think it will be cheaper for me because I’m dangerous in the grocery store. I’ve been considering this but honestly some of the upcoming meals do not look appetizing! I have a picky 15 yo son with Aspergers and I’m not sure he is going to eat some of it. Their meals also look somewhat carb heavy and I try to keep that in moderation (but certainly no low carb). Anyone have thoughts on these issues who has been using Dinnerly for a little while? That’s definitely a downside of a meal service…I imagine sometimes there are meals that don’t fit exactly what you want to be eating! Can you stop delivery at any time.? You cannot stop delivery immediately after signing up. I chose the box size, gave credit card info and only then saw the extremely limited menu choices. Anyone with sugar or salt issues will have a problem. Tried to substitute and three other meals offered were high in sugar and salt as well. My point: tried to cancel first shipment after ONE minute, and I cannot. Says “Delivery in progress”. I canceled further shipments but am stuck paying for meals that I cannot eat. Either allow people to cancel within X minutes of meal selection on signup or show choices BEFORE credit card info given and you are locked in. NOT happy. I’ve been using HelloFresh for a couple of months and I absolutely love it. But when I saw the ad for Dinnerly and the price was half the cost, I was intrigued. I googled the menu and was unimpressed. There was nothing I was interested in trying. Then I looked at your review because maybe there was something I was missing. I appreciate your frankness but having to come up with sides don’t seem like saving money. I appreciate having a nain course option with 2 sides. It is just 2 of us and my husband and I both want meat with our meal. Based on your review and the fact that you haven’t tried the others hasn’t convinced me to switch. HelloFresh uses recyclable ice packs and wrappings too. For 2 people the cost is under $60 and I feel that’s very reasonable and there’s no shipping fees. Thanks again for your review. Thank you so much for the review of Dinnerly! I have tried Blue Apron, Hello Fresh and Home Chef. Blue Apron was a bit complicated for my taste. Home Chef was AWFUL. I wouldn’t receive all of the ingredients or the food was rotten…every time. I have had the best luck with Hello Fresh, but even some of those meals are not to my liking. I came across a Dinnerly ad on Facebook with a $20 off coupon. My first box comes the week of May 1! I love the idea of home meal kits and really hope that Dinnerly will be a good tasting, cheaper option! I got my first box two weeks ago and was super excited but unfortunately they are not all they say they are. You get what you pay for! My week 2 box never arrived and the agent apologized and said he would give me a discount of 50% off my next box. He ended up giving me a disgraceful $1.01 off my order. My shipments are scheduled to arrive on Mondays and again my shipment is late and when I try calling nobody picks up or returns calls. Very unprofessional and disappointing experience. My box arrived missing all ingredients for one recipie! I called customer service and they refunded 10 dolloars. Never one apology or attempt to keep my business knowing I completely cancelled my service. I’ll take my money to the grocery store and know I’m getting everything I paid for. A friend of mine just had that exact same issue. There is something not right with this company. Im sure the blog owner had a great experience because the company needed her to promote it with her review and it looks like it worked. Ive got 2 weeks of recipes so far and have loved it. For someone who has literally never cooked anything except scrambled eggs this has been awesome and i feel like i can actually do something in the kitchen. Love the simplicity of the recipes and the fact theres not a lot of ingredients. Only 1 recipe i didn’t like was the cheddar broccoli soup but everything else has been amazing!!! That’s so great! I think these meal kit delivery services are probably just perfect for someone like you who is new to cooking. So wonderful to gain some confidence in the kitchen. I have been wanting to try Blue Apron and Hello Fresh but they frugal part of me would not let me. So was excited to hear Dinnerly was much cheaper! Thanks For the great info Kristen! I have been getting the meals from dinnerly for 3 weeks now and I absolutely love the food items and you cant beat the price. I’ve had no issues whatsoever. I have cancelled home chef, pantry boy, and hungry root after trying these. These others are all double the price but I think dinnerly has better quality. The food all comes out super delicious also! I will continue to use this meal delivery service. Meals don’t take long to make either which I love! I am a nurse and work long hours so I need something quick and healthy at the same time. 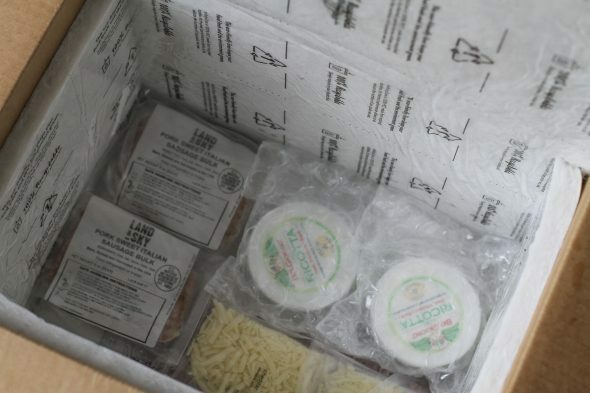 Some meal delivery companies allow choices for special dietary concerns, such as gluten free. Does Dinnerly offer any choice options? As far as I know, they do not. 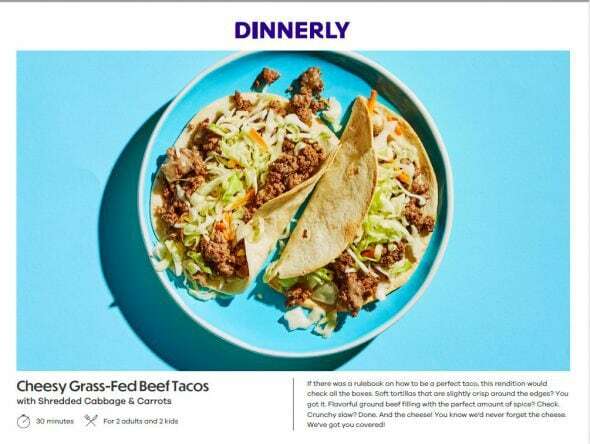 Dinnerly is a much more basic meal kit service than others, which is part of the way that they keep things half the price of other companies. I was just looking into Dinnerly, but the calories per serving are atrocious! 800+ for a vegetarian serving is way too many. For this to be a thorough review you really should’ve discussed shipping cost, most others such as Blue Apron ship for free. Also this service is the only one I know of that doesn’t allow customers to customize their menu. Disappointed by this review. We are gluten and dairy sensitive. Will there be enough menu options for us to avoid grains and dairy? Two of the meals I got this week have no gluten and could be easily modified to leave out the dairy. I believe you can view sample menus at Dinnerly’s site to get an idea of what options there are. I have tried both those services. One was terrible and I didn’t get all my groceries for my meals, the other one was hit and miss but mostly YUM. But it was very repetitive I mean how much Balsamic do you need in a week. Both price only reason I gave it up, that and the harassment if I skipped too many boxes. It was like talking to a car sales man it did not stop until i agreed on the box they wanted me to get even though I said several times my child like and three of the things in the box would make me sick. Hoping this one works out. Thank you for your blog. I have tried Blue Apron, Home Chef, Hello Fresh and Dinnerly!! I notice some send seasonings fresh where you need to peel and grate, some send the same seasoning peeled, grated and in a jar. I noticed Dinnerly keeps their cost low because they don’t include tiny items that are staples in any home, sugar, egg etc and recipes are on line! 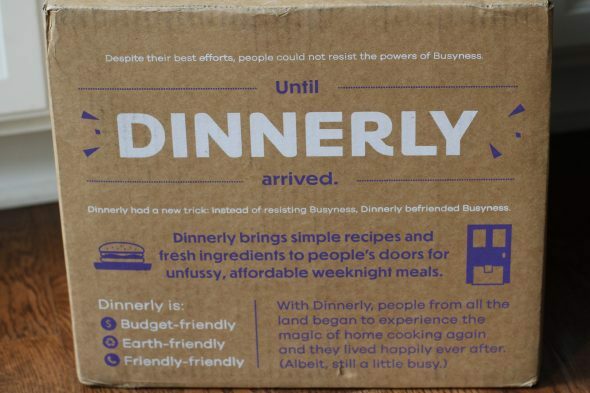 For the price, Dinnerly is great, we are on a limited income and after 50 years of figuring out WHAT to make for each meal, do I have all the items etc, this works really great. We have never had a bad meal from any of them. I am new to Dinnerly. My first order showed up on the day specified but was missing items. One of the packets of sauce had opened and created quite the mess in the box. The meals where easy to prepare and had a good taste, I like the no waste. Order #2 did not arrive on the specified day, but a day later, the box was open and everything in the box was hot, so the meats and other items where of no use. I have tried to reach out to the company by email and telephone to discuss this and request a refund for that order. Still have not heard back from them at all. My third order was charged to my account today, needless to say I am beyond frustrated at this point. I am beyond frustrated with this site being a picky eater. They charged me before I could even look at the meals offered. Then, after all of them disgusted me except for one, I couldn’t cancel or reach them with this being a Sunday. I went with email demanding a refund as I had not actually placed an order and PayPal was no help. This seems like a scam to get your money even when you don’t want to order. I placed an order with Dinnerly and Pay Pal – had to provide a payment before being able to see their menu. I found the menus unsuitable for our tastes and immediately cancelled the order and went to PayPal and cancelled the payment as well. Shortly after that my PayPal account showed a payment had been made. I was informed by Pay Pal that I would have to request a refund from Dinnerly through PayPal. The e mail address they gave me did not work. I am now in the process of trying to get this resolved. Will see what happens but after reading some other reviews, I think this company has some work to do on their customer relations. I would not recommend paying until you can see their menus. Our local grocery stores are now offering grocery delivery within hours of an order or letting them do the shopping and have it ready for you to pick up. 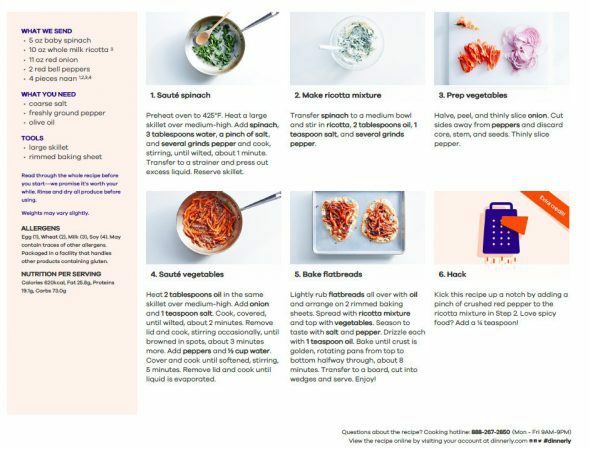 Kroger is also putting meal plans and recipes on their web site so you can know exactly what you would need to order for your meal or meals and there is not a fee for that. Plus they offer exclusive coupons for some items on their “click lists” as well. The food industry is really expanding their services! I have been using dinnerly for the last 4 weeks for my husband and myself. There are individual sides for some meals and none for others it depends on what you order. Just finished our meal of Grass-fed burgers, spicy slaw and fried pickles. I changed our order for this past week to 4 portions per meal instead of 2 just to gauge how much you received with the 4 portions. I figured we could have left overs for the next day. Worked out splendidly. So far we have been happy with everything we have received. My husband doesn’t feel like the portions are satisfactory but I think they are just a little more than I would normally eat each meal so I guess the portion sizes are subjective. I have to say I get tickled at people when people say they are experienced cooks and these are elementary meals. They are not what I would call elementary meals but they are simple and tasty. A definite goal for people that have been working a 12 hour shift and need to get a good tasting meal prepared and served quickly. We do not eat out so these work really well for us. I am glad we tried them and will stick with them to give them a chance to grow. I really don’t have any complaints. We live in a rural area so 8.99 for shipping is no more than I would pay to drive to the store and back in the nearby town. I am expecting my first shipment of dinnerly tomorrow. We are retired and I’m an enthusiastic scratch cook. My reason for signing up is I want some new ideas for dinner, and the cost of dinnerly falls within my budget, which is $10. per dinner, or less, for the two of us. I may wind up saving money. We are not big eaters, so even if the portions are small (which according to reviews they are not) it will be plenty. I don’t mind shopping, and I don’t mind cooking, but I’m weary of trying to think of new things to make. I figure after 50+ years as a wife and mother, I’ve had to come up with easily 17,000 dinner ideas. We are also not picky, so there is practically nothing dinnerly could send us that we wouldn’t like. I just received my first box. Rotten green beans and a box that was terribly packed. Everything just thrown in. Buns do not travel well with free moving potatoes and other heavy items. I did report the beans and got a $5 credit. Not going to use it though. Once was enough. Does Dinnerly have low carb meals? 20$ plus shipping for 4 person 2 tacos each. Meat, cheese, lettuce, tortilla, rippoff. I feel like I should start my own dinner meal service after that experience. I’m no chef but c’mon I can do that it in my sleep so can my 10 year old I blame the parents. Also I forgot to mention that they wont show you the menu items until you complete your whole profile and give your credit card ridiculous and stupid that should be your first warning. Actually, there’s a “current recipes” link up at the top of the site. Thanks for the promo code. We’re gonna give it a try. I used Blue Apron for more than a year before switching to Hello Fresh. When my husband died I stopped Hello Fresh. I saw Dinnerly as a lower-cost alternative, even though I’m by myself. I just received my first box today. It’s awful. No lining in the box like you pictured. Vegetables just thrown in the box. Meats and other perishables in a bag with a melted ice pack. NO RECIPE CARDS. I tried to log in and it wouldn’t accept my password. I clicked on “reset my password” TEN TIMES but never received the link. I want to access my account so I can get recipes and CANCEL THE DARN ACCOUNT. I’m also reporting Dinnerly to the BBB.